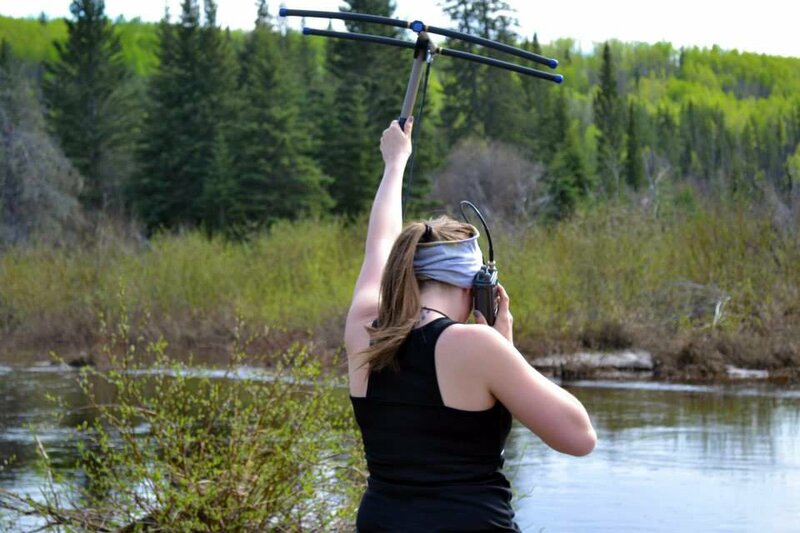 Tracking Grey Wolves in the boreal forest. Photo credit: Caribou Monitoring Unit. Development in the boreal forest is changing the way Grey Wolves move and hunt. What will this mean for the endangered Woodland Caribou? 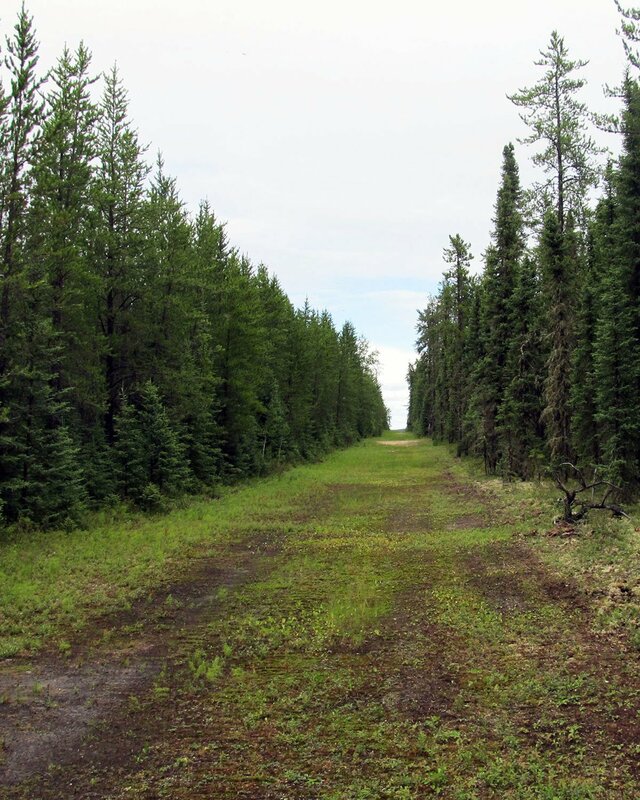 A seismic line through the boreal forest. Linear features like seismic lines, pipelines, and roads are an increasingly common sight. Photo credit: Caribou Monitoring Unit. Travelling from Edmonton to Calgary, most people take a four-lane highway instead of a maze of back roads. After all, a direct route to their destination leaves more time for actually doing whatever it was they set out to do. The same principle applies to animals—the less time they have to spend just getting around, the more they can devote to important stuff like finding food. 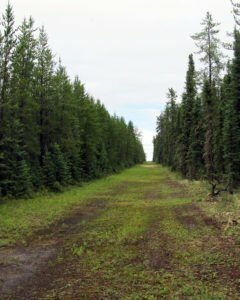 Take the case of Grey Wolves in the boreal forest: more and more potential pathways for them to travel along are appearing through the creation of roads, power lines, and seismic lines for industrial expansion. Does all this development actually influence how wolves move through the forest? Several recent studies suggest that changes to the landscape caused by humans do alter how predators interact with their prey, but concrete evidence has been rare. Now, research supported by the ABMI* confirms that human-made features like roads and seismic lines may serve as ‘highways’ for Grey Wolves by letting them travel farther and faster in their search for food. This changes the game for prey like the endangered Woodland Caribou—and that’s a big deal. 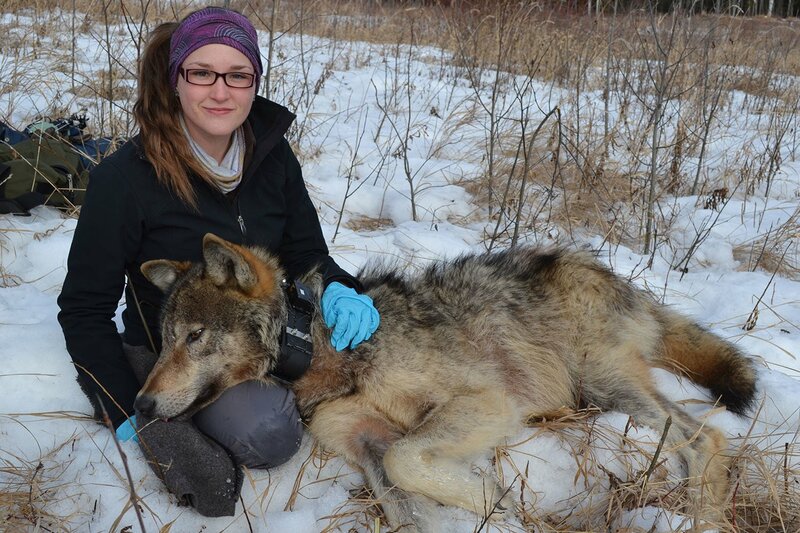 Researcher Melanie Dickie with a sedated wolf. Master’s student Melanie Dickie, Drs. 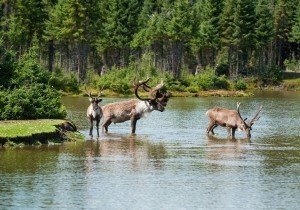 Rob Serrouya and Stan Boutin of the ABMI’s Caribou Monitoring Unit, and Dr. Scott McNay of Wildlife Infometrics are behind the research, recently published in the Journal of Applied Ecology. “[Our] research applies knowledge based in ecological theory to a particular problem [species] are facing around the world—human development”, says Dickie. She and her team placed radio collars on 22 Grey Wolves in Alberta and Saskatchewan to track their movement. Then, they used satellite imagery to relate wolf movement to linear features—long, narrow human-made features like roads, power lines, trails, and seismic lines. The questions were, would wolves choose to use these features, and would they move farther and faster along them than in natural forest? 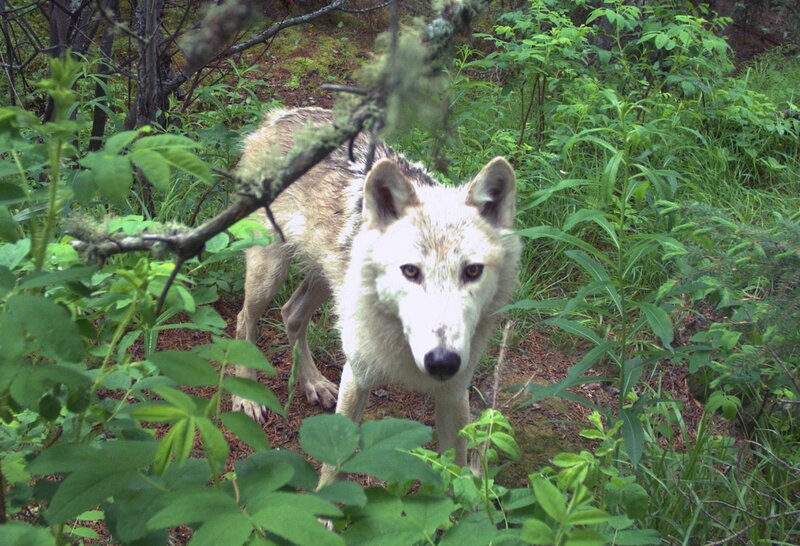 A Grey Wolf investigates an automated trail camera. As you might predict, the answers to both questions were “Yes”. Dickie and her team found that wolves chose to move through linear features when available, and that by doing so they could move two to three times faster than in natural forest. These factors combine to increase the wolves’ search rate, which essentially means they can increase their hunting efficiency. That’s great for wolves, but it could have serious consequences for Woodland Caribou. “Society has placed a lot of value on caribou, and rightly so,” says Dickie. “The logical next step is to see how [linear] features affect wolf kill rates, or more directly, caribou predation…but it’s easier said than done”. There are also other factors at play, including other predator and prey species, habitat loss, and so on, and they need to be assessed before the full effects of human development on natural ecosystems can be fully understood, let alone minimized. Photo credit: Howard Sandler, Shutterstock. While more research is needed, Dickie and her team have taken an important step toward understanding how human development, like linear features, is influencing caribou populations. And, maybe just as importantly, they’ve gained valuable insight into just how complicated the issue is. “I came into this research with very black-and-white views on how the conservation game works,” says Dickie. “But now I understand all of the grey that is involved—it isn’t as easy as it may seem to ‘save’ a species [the Woodland Caribou] that is declining so rapidly.” Ultimately, we may be faced with tough choices. For example, are we prepared to alter development plans to preserve normal wolf movement and slow the decline of caribou populations? As Dickie says, “We have to make some sacrifices, change our perspectives, open our minds and be creative.” Of course, some linear features, like already-established roads and power lines, are here to stay. But others can be modified, and for now the researchers recommend restoring conventional seismic lines and pipelines as quickly as possible to minimize their impacts—potentially even by felling trees or creating other barriers to slow wolf movement back to normal levels. Regardless, this work is a great example of how research that’s based in ecological theories can help support management decisions in the real world. That’s something we can all get behind. *This research was undertaken with the financial and logistical support of the Regional Industry Caribou Collaboration, in which the ABMI is a partner. The ABMI contributed to planning, experimental design, fieldwork, and analysis through its Caribou Monitoring Unit.